Browse our extensive range of featured teaching and learning resources for 2019, developed specifically for higher education students in Australia and New Zealand. Partner with Wiley to provide each and every student with seamless access to their prescribed learning resource, right from the first day of class. Our latest white paper explores the emerging trends in Australian higher education and why increasingly more faculties in the region are pursuing inclusive access models of providing learning resources to all students. Wiley Direct is the online destination for university students in Australia and NZ to purchase their Wiley learning resources at the cheapest price. Flexible print and digital textbook options, from just $65. 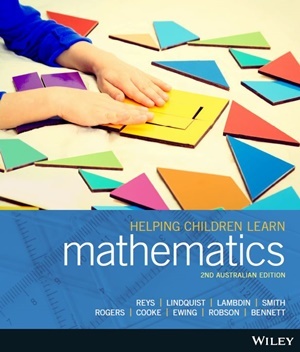 The second edition of Helping Children Learn Mathematics (Reys et al.) is a practical resource for undergraduate students of primary school teaching, rich in ideas, tools and stimulation for lessons during teaching rounds or in the classroom. This second edition provides a clear understanding of how to navigate the Australian curriculum, with detailed coverage on how to effectively use Information and Communications Technology (ICT) in the classroom. Available as a full colour printed textbook with an interactive eBook code, this title enables every student to master concepts and succeed in assessment. Lecturers are supported with an extensive, easy-to-use teaching and learning package. Select the features from the right hand side menu to see more details. 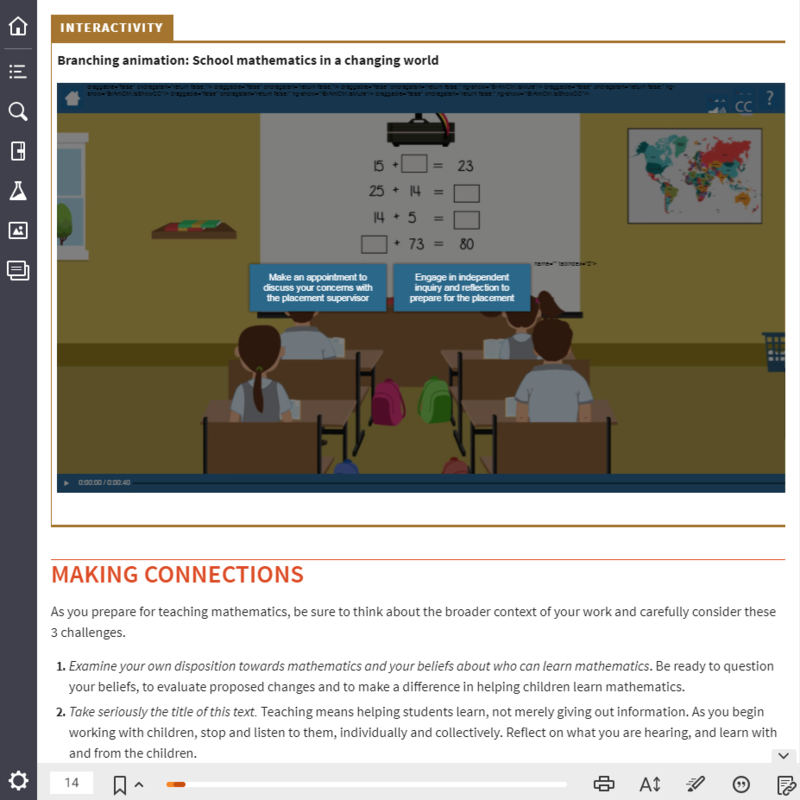 Animations and interactives embedded at the point of learning bring course concepts to life. 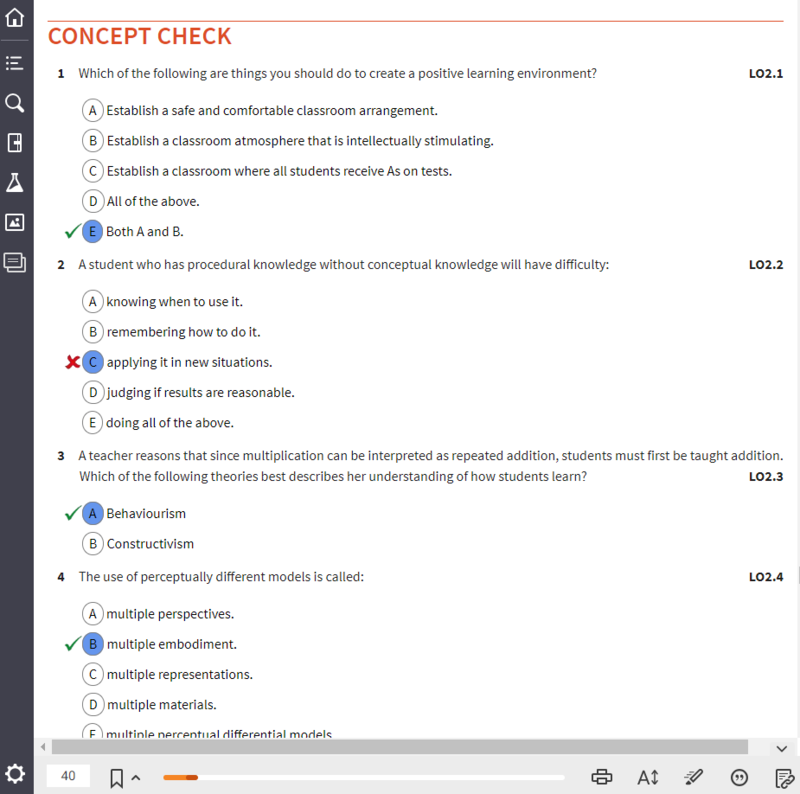 End of chapter quizzes let students test their comprehension, with instant feedback providing guidance for further study. 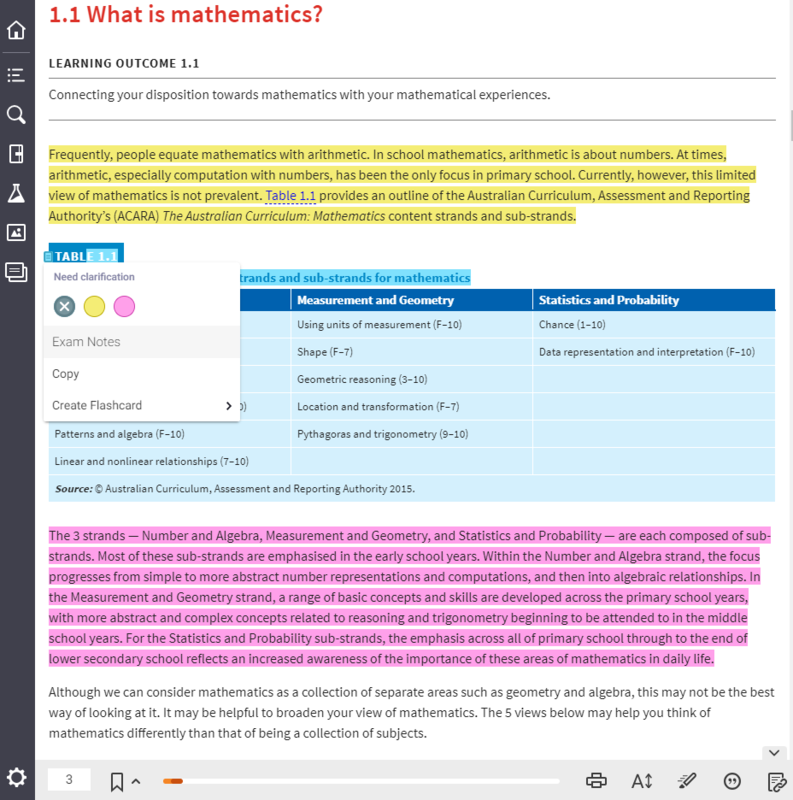 Interactive textbook lets students search, highlight and take notes within the text for efficient study. Robert E. Reys is Curators’ Professor of Mathematics Education at the University of Missouri, Columbia. He is a former mathematics teacher and district mathematics coordinator. His research interests are in the areas of calculators, mental computation, estimation and number sense. Bob has authored over 200 articles in professional journals. He was General Editor for five yearbooks of the National Council of Teachers of Mathematics (NCTM) and co-edited the 2010 NCTM Yearbook Mathematics Curriculum: Issues, Trends, and Future Directions. He was awarded the Lifetime Achievement Award for his service, leadership and research by the Mathematics Education Trust of the NCTM. Anna Rogers is Lecturer in the School of Education at the University of South Australia where she teaches reception to Year 7 mathematics education courses in the undergraduate and postgraduate programs. Anna has been an educator for 35 years. Initially a secondary teacher with mathematics speciality, she taught students in country and city schools and in Adult Education. During her academic career Anna has focused on creating positive learning environments for her students, authentic assessment tasks, and building student confidence and competence in mathematics teaching and learning. Her research interests and publications include early childhood mathematics through play, place value activities and intervention, equity issues including gender and sociocultural disadvantage, and mathematics knowledge for future teachers. Anna has been awarded citations both locally and nationally for her commitment, contribution and enthusiasm to both the teaching and learning of mathematics. 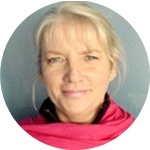 Sue Bennett is Lecturer in the School of Education at Deakin University where she is a course coordinator for the Bachelor of Education (Primary) degree. She teaches in the primary mathematics education and education major courses for pre-service teachers, and supervises students’ practicum. Sue has been an educator for more than twenty years, teaching in both schools and universities in Victoria. In addition to classroom teaching and school-based curriculum development, she has developed curriculum for the Victorian Ministry of Education, worked with AAMT and Monash University on the Excellence in the Teaching of Mathematics Project, and taught in mathematics education programs at a range of universities, to both pre-service early childhood educators and pre-service primary teachers. 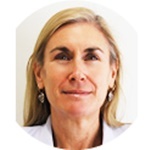 Audrey Cooke is Lecturer in Mathematics Education in the School of Education at Curtin University. She has worked with pre-service teachers since 2007 with a focus mostly on mathematics education, having created, coordinated, and taught mathematics education units for Bachelor of Education students in both Early Childhood and Primary courses. She has worked on course reviews within the School of Education and is passionate about mathematics and mathematics education. Audrey is interested in how people interact and engage with mathematics, particularly pre-service teachers. Her research includes disposition towards and engagement with mathematics, relationships between disposition and mathematics classroom discourse, and use of ICT in education. 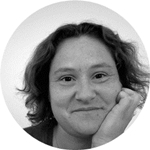 Audrey is a reviewer for journals and conferences and contributes to mathematics education conferences nationally and internationally. Kylie Robson leads numeracy instruction at Charles Weston School Coombs in the ACT as a Curriculum Focused Executive Teacher. Kylie works with educators to design, implement and evaluate high-quality mathematics programs and provides professional support to individual teachers. Initially a primary school teacher with a passion for mathematics, she has taught students from Preschool to Year 6 and been an educator for over 15 years. Prior to this, she held the position of Clinical Teaching Specialist at the University of Canberra, where she taught a series of Mathematics Education units to undergraduate students as part of the Bachelor of Education degree. Kylie’s research interests and publications include the use of quality literature in the mathematics classroom, embedding meaningful discourse into mathematics teaching and the impact of teacher efficacy on student performance. Bronwyn Ewing is Senior Lecturer in the School of Curriculum at QUT. Bronwyn graduated with a PhD in the area of early school leavers’ experiences of mathematics education in 2009. She takes a transdisciplinary approach to research to integrate disciplines and address the teaching and learning of mathematics to students and adults from low SES background, Indigenous students, students with disability and students in youth detention. Before commencing her academic career, Bronwyn was a primary school teacher, fulfilling a number of extra curriculum roles. We offer you the flexibility to design the optimal learning path for your course. Based on your course goals, you can customise a Wiley resource within your Learning Management System and build a seamless learning design around it. From your LMS, create links to a Wiley textbook’s page, paragraph or even a sentence; keep only what’s relevant, hide sections your students don’t need to see, and create customised reading assignments to allow a truly unique learning experience. Students have fast and easy access to quality, relevant content at the point of learning – with everything they need in one place. Students can purchase their textbook with interactive eBook code from Wiley Direct: Helping Children Learn Mathematics, 2nd Edition (Reys et al.). Wiley Direct is an initiative of the Wiley Affordability Program. As part of our ongoing commitment to higher education, the Wiley Affordability Program is dedicated to providing students with premium Wiley learning resources at an affordable price. We believe that every student has a right to access quality resources, no matter what their budget is. Now, we are even better equipped than before to do what we do best; help teachers teach and students learn. Copyright © 2000-2018 by John Wiley & Sons Australia, Ltd., or related companies. All rights reserved.